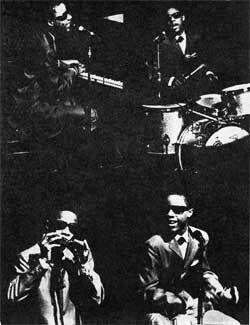 Stevie Wonder performed at The California Ballroom in October 1967. 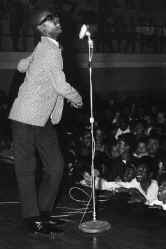 It was his second visit to this country, the first being with the Motown Review in 1965. Always accompanied by his tutor and guide Ted Hull, Stevie was a prodigy when it came to music. He played most instruments with skill and ease and soon outstripped those who taught him. Stevie was a great laugh, he would ask me what a particular lady was wearing and when I said "a blue dress" he would walk over to her and compliment her on it and thoroughly enjoy her confusion as to how he knew. He also loves his puddings, so much so, that he orders his meals back to front. If he gets full then he can leave the starter but always gets his pudding. 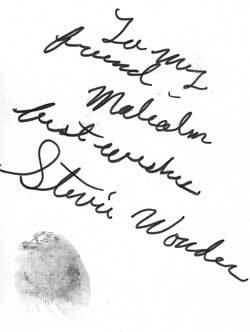 There is some discussion about what constitutes a Stevie Wonder autograph. Stevie would get get Ted Hull to write them for him. Below is one written for Malcolm Cook who watched Ted do it and then forced Stevie to put his thumb print underneath!